Now, I consider my game collection to be somewhat precious. It’s taken a lot of work to make it as awesome as it is, and I’m rather proud of it. So, I sometimes wonder, would someone dare to steal it? And the answer is invariably no. For board games are not considered precious to most people. But precious gems are. I presume you can see where I’m going with this. Today, I’m pulling one of my go-to board games off the shelf. It’s a game about ruby stealing thieves, shady smugglers, forging jewelers and crooked cops. And it’s one of the priciest games I own. 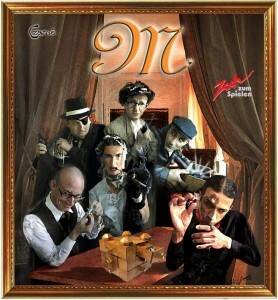 “Master Thieves” is a game of theft, deduction, deception and intelligence. And it’s actually fairly rare! The fact that the game is hand-made, imported, and expensive combines to make it… a little outside the mainstream. Which is kind of a shame, because of how much fun it is. 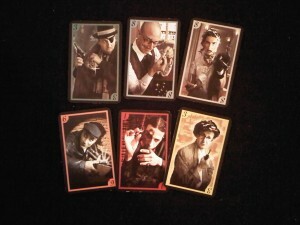 On the other hand, it makes playing “Master Thieves” a somewhat rare experience, which kind of adds to it’s appeal. Unless of course you’re like me, and you own a copy for yourself. Let’s crack this thing open. First sign that a game is awesome – it doesn’t come in a box, it comes in a wooden chest. “Master Thieves” isn’t fooling around here. The box is sturdy, heavy, and filled to the brim with fun. 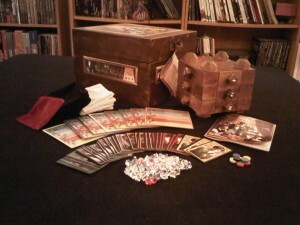 And I say it’s filled to the brim with fun – because there’s actually not a lot of components for this game. You’re looking at an instruction manual, a handful of cards, some pillows, player cards, wooden and plastic tokens, and a puzzle box. Yes. The most notable piece in “Master Thieves” is also the component that makes it such an expensive game. 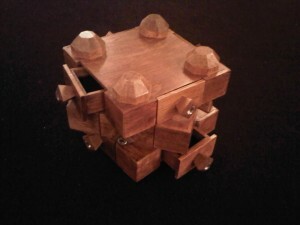 The puzzle box is the core of the game, and they’ve put care into it’s design. They’re designed to rotate in three sections, with twelve drawers. There are six regular drawers, and six that contain a secret compartment – and they’re all double sided. But the puzzle box isn’t the only beautiful part of the game. The story goes that the designer came up with the idea for “Master Thieves” while pondering what to do with all the extra bits of plastic left from making components for another game. Whether or not that’s true, you have a pile of plastic gemstones in three colours: red, blue and white. You also get some velvet cushions to keep your gems on – black, white and a single red “evidence” cushion. The rest of the components to the game aren’t as fancy. You get a deck of cards, a player card in one of eight colours, and a matching wooden disk. At it’s heart, the gameplay of “Master Thieves” is simple, and it’s all based off the use of the puzzle box. Everything you do in a turn is essentially a variation of the following: take something out of the box, put something into the box, then turn and flip the box. 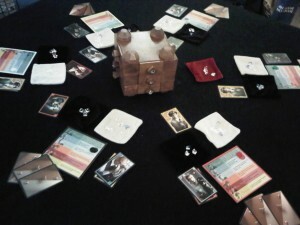 The box itself is seeded with some gems at the start of the game – a handful of diamonds, and the six rubies which are all placed into the secret compartments. Every player starts with some “fake” gemstones on their white cushion which they’re working to dispose of. These gems will all be worth negative points at the end of the game. Gems can only be disposed of by putting them into the puzzle box. Meanwhile, anything that comes out of the puzzle box is a real gem. You’re trying to accumulate these on your black cushion, where they’ll be worth points. But you have to be careful! You can only claim gems that you remove from a right-side-up drawer – if you cause anything to fall out of the box from an upside-down drawer, it goes on the red “evidence” cushion, and your turn ends. At the beginning of each round, everyone selects one “role” they’ll play from the hand they’ve been dealt. Each hand will contain one of each of the roles, numbered 1 to 8. During the round, each role acts in turn – multiples of the same role act in their numbered order. First to go is the Smuggler. Smugglers try to move fake gems out of town, while bringing in authentic ones. They also act as a team – but are happy to backstab one another for a profit. A Smuggler opens a drawer, takes out any real gems, and puts a fake one in the box. The gems removed go on the red “evidence” cushion, not to the individual Smuggler. If anything falls out – it also goes on the red cushion, but the Smuggler can’t put anything in the box, and doesn’t get a cut of the loot. After all the Smugglers go, the Detectives reveal themselves. If there are more Smugglers than Detectives, any that weren’t caught during the turn get a share of what’s on the red cushion. Next go the Jewelers. Jewelers keep vaults that are well protected. As such, don’t take anything out of the box, but can set an alarm in an unalarmed drawer, and place a gem with it. If there are already gems in the drawer, so much the better – for when someone else trips the Jeweler’s alarm, the Jeweler gets all the gems that fell out. Gemologists are next. 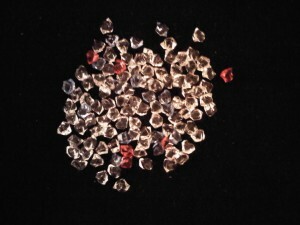 The Gemologist spots and gets rid of fake gems. She doesn’t take anything out of the box, rather she puts one of her fake gems into it. She can also put in additional gems for each Detective in play – they help her sniff out extra fakes to get rid of. The Gemologist is also the only role that can take it’s action, even if she gets “caught” by making something fall from the puzzle box. Thieves are next. The Thief is looking to loot drawers, but they’re “caught” if they spill anything from the puzzle box. 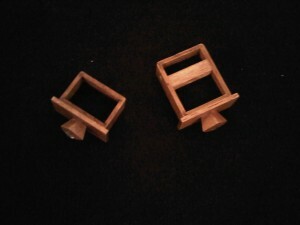 They also can’t remove drawers from the puzzle box – only open them as far as the main compartment. Anything the Thief finds in a right-side-up drawer, though, is all theirs. Master Thieves are good enough to find secret compartments. They get to actually pull a drawer out of the box, and hopefully find a shiny ruby in the compartments. Rubies never go on the red cushion, either. Any rubies that spill are put back for another Master Thief to try for. Finally, it’s the turn of the Detectives. 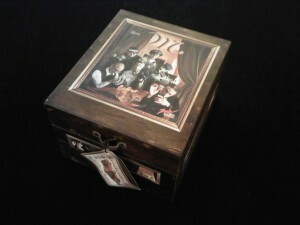 The Detectives are all crooked, but they’ll never get their hands dirty by touching the puzzle box. Instead, they split up the evidence on the red cushion at the end of the turn. “Master Thieves” is another game where the gameplay is deceptively simple. The game is fundamentally a constantly evolving puzzle, where everyone is trying to solve it, while simultaneously adding complexity to it. I’ve seen Thieves rob a drawer they seeded the turn before as a Gemologist. I’ve seen three Master Thieves work to screw each other out of possible secret compartments, while desperately searching for rubies. I’ve watched a Jeweler trip his own alarm by accident, ending up with nothing. I’ve seen a pair of lucky Detectives gain a whole handful of gems after a particularly unlucky turn for everyone else. What I’m getting at is “Master Thieves” is a tremendously fun game. It’s challenging, intelligent, social and absolutely worth seeking out for the opportunity to play.